Motor museum | Autozine regularly receives invitations to come and see (private) car collections. In most cases it's for sports cars. Impressive, but anyone with money can buy exotic cars. The invitation from mister Katsumi was more interesting: he collects classic Japanese cars that changed the Japanese car-industry. 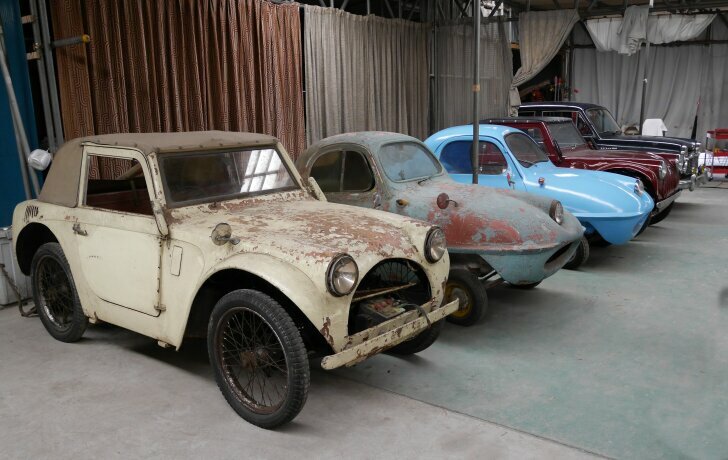 A visit to the collection of mister Katsumi does require a bit more effort than visiting the average collector. As the name of the host already suggests, these cars aren't exactly parked around the corner. The warehouse in which the cars are stored is located in Saitama, Japan. That means a thirteen-hour airplane flight and then two hours by train. Finally, mister Katsumi is waiting, who then informs us that a one-hour drive by car now awaits. After more than 10,000 km of travelling, a rather unassuming shed in an anonymous rural village awaits. The inside looks like a second-hand clothing store rather than a car museum. Under piles of covers, towels and other protective cloths the promised cars finally appear. And every time a cover is removed, a story is told. Katsumi obviously favours "orphans". 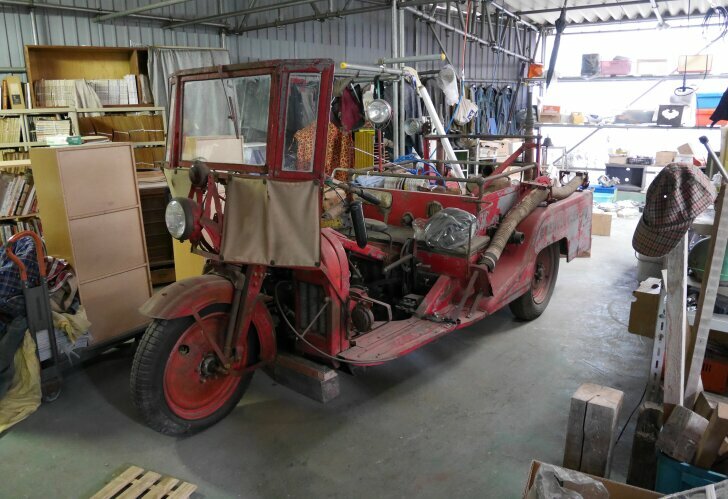 For example, thirty years ago he rescued a three-wheeler Giant fire truck from being scrapped. Once, this subsidiary company of Nissan was the leading manufacturer of three-wheelers in Japan and it even built (Hien Fighter) airplanes. Now, only this obscure vehicle remains. 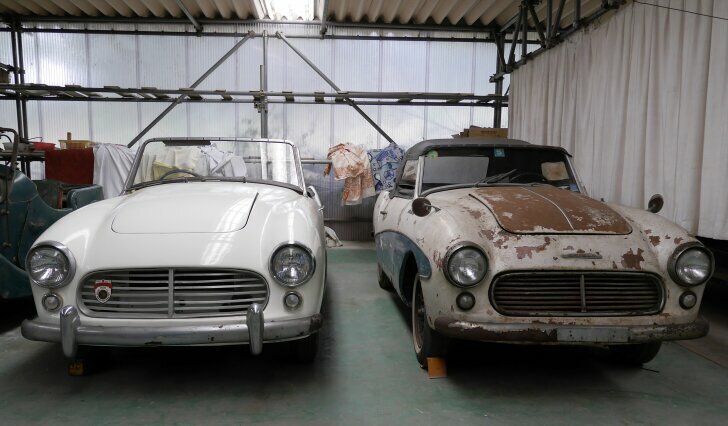 The "Datsun Fairlady" (a far ancestor of the current Nissan 370Z) shown here was also rescued from demolition. A famous Japanese motoring journalist found the car and when Katsumi heard about the find, he had to have it. That's because it is a rare left-hand drive model for the American market. 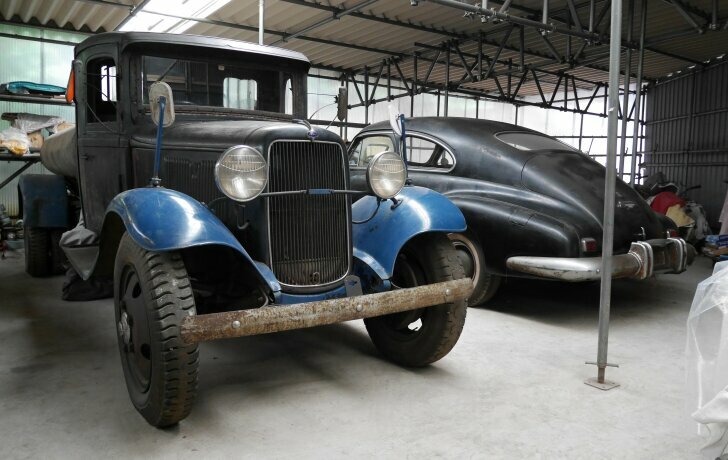 The vehicle has been in the collection for 40 years now, still unrestored. Do notice the white example next to it, which is made out of plastic. That's because it is an early prototype of the Fairlady! 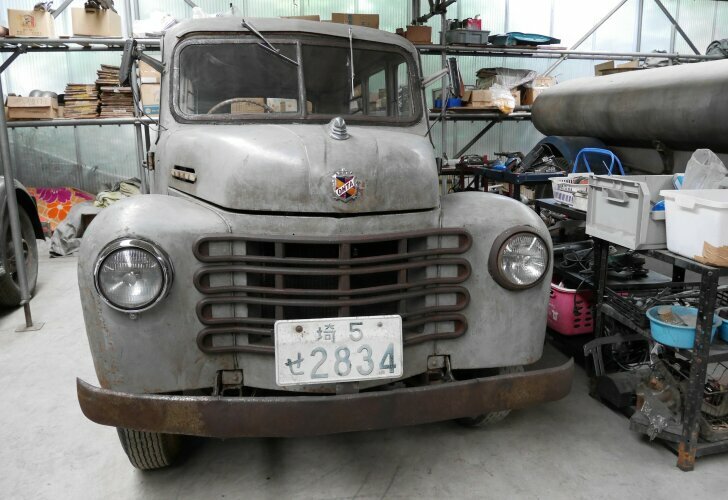 Amidst all the small and often cute Japanese cars, one vehicle stands out like an odd duck: the "Ford V8" lorry. It turns out it was built in Yokohama in the 1930s. In those days most roads in Japan were unpaved and lorries with water tanks sprayed the dirt roads to avoid dust clouds. This V8 isn't just the only remaining example, it has also been used to water the gardens of the Japanese emperor. Another forgotten jewel is the OTHA, a brand that is now part of Nissan. The example shown here is from 1953 and it's the last model the brand ever made. The pride and joy of mister Katsumi are the so-called "kei cars". In Japan, small cars (max. 3 metres in length, 1.40 metres in width) are eligible for a tax discount. The "Flying Feather" from 1955 is a predecessor of the modern kei car. Employed by Suminoe Seisakusilyo designer Tomiya built only 50 cars, but that was enough to change the Japanese car industry forever. From a technical point of view the Flying Feather left a lot to be desired. For example, the wheels came from a motorbike and the roof construction was inspired by the Citroën 2CV. With drum brakes only on the rear wheels the Flying Feather either doesn't brake at all or stops at once. So in 1957 Tomiya tried again, this time as an employer of the "Fuji Jidosha" company. 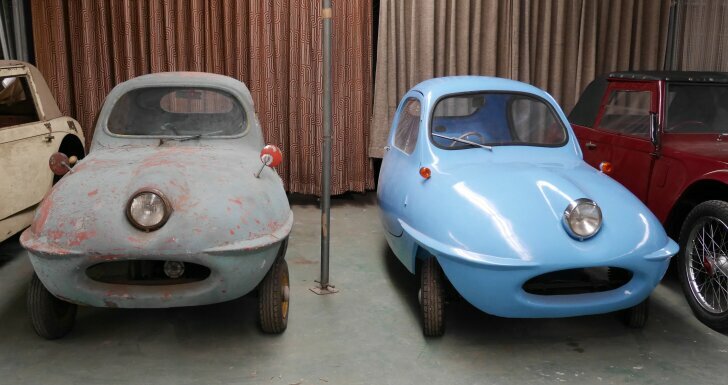 The resulting "Fuji Cabin" is still amongst the smallest cars ever built and is more like a scooter with a roof than a car. 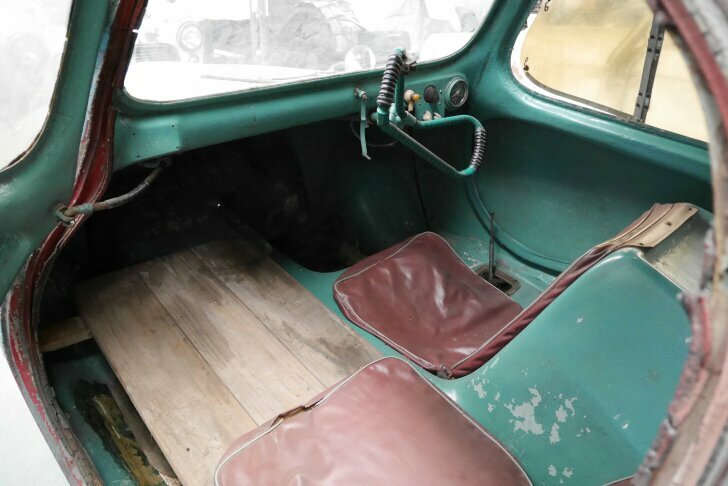 The unrestored example is a prototype with an airplane-like steering wheel, only one door and only one headlight. In due time the other car was restored, so the "plastic monocoque body" now looks like new again. Still, Katsumi hardly ever drives these cars. "Compared to modern cars these old-timers are dangerous and loud. They are so slow that walking may well be faster. Therefore these are cars you want to own, but not drive", he states. So we didn't. After the interview is done all cars are wrapped in their covers again, continuing their long sleep. Nighty night! Ever since he was a teenager, Hayashi Katsumi has been a true car nut. And ever since he bought his first car, he dreamt of opening his own car museum. Despite his obvious nag to acquire special cars, the museum was never realised. The legal and practical hurdles were simply too tall. Yet, this private collection is as interesting as the average museum. Surrounded by thousands of car magazines and uncountable car parts, Katsumi cherishes a collection that shows how the early Japanese motoring industry developed. While most museums draw large crowds by displaying sports cars, Katsumi focusses on the forgotten brands that did the real pioneering. And that made the long, long journey worth while.